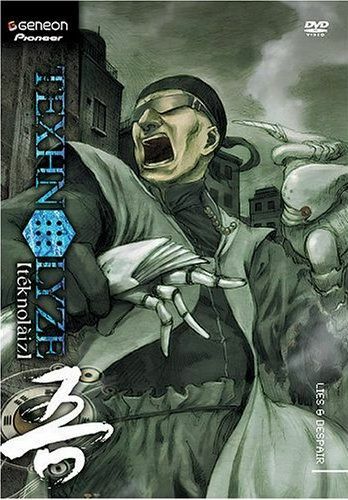 Texhnolyze takes place in a man-made underground society, a group of banished descendent battle in order to gain control of the crumbling city of Lux. The story focuses on a fighter named Ichise, who loses an arm and a leg to a fight promoter. Ichise is taken in by a doctor and is used as a guinea pig for Texhnolyze, which gives him a new mechanical arm and leg. He is eventually taken under the wing of an organization called Organ, who already has control over a majority of Lux. As Ichise joins in the war for the city, he meets a young prophet named Ran, who shows him the future and guides him out of the dark side in order to find the truth about Lux and fulfill his true destiny.